Russia has stopped all cooperation with the North Atlantic Treaty Organization (NATO), Deputy Foreign Minister Alexander Grushko said in an interview with state media on Monday. The Western alliance suspended military and civilian cooperation with Russia in the spring of 2014 in response to Moscow’s annexation of the Crimean peninsula. Several disputes, including a naval standoff in the Kerch Strait and the U.S. withdrawal from a Cold War-era nuclear treaty, have further strained ties between Russia and the 70-year-old bloc. “NATO has itself abandoned a positive agenda in its relations with Russia. It doesn’t exist,” Grushko told the state-run RIA Novosti news agency. 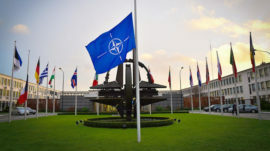 Grushko, Moscow’s permanent representative at NATO between 2012 and 2018, said the current standoff mirrors the Cold War “status quo” that brought about NATO’s creation in 1947.